As a medium moves forward, it’s often the case that things that were important and indeed integral in its early days become obsolete or out of vogue. I’ve talked about this a bit before with regards to shoot-em-ups, adventure games, and belt-scrolling beat-em-ups, but one genre I haven’t mentioned yet perhaps represents some of the earliest and most important roots of the hobby of electronic gaming. Chances are, if you’re old enough, you’ve got memories connected with light gun shooters in some form or another. Both in the arcades and at home, light gun games enjoyed quite a long period of popularity, possibly because of how straightforward they are to understand. At their core, you just have to point and shoot, and although new elements were added over time like reloading, choosing different routes through stages, and using cover, they’ve always been something you can easily pick up and play. Like a wounded animal, the genre took a while to die, but the minute B.J. Blazkowicz first picked up a pistol and put a bullet in a Nazi, the days were almost certainly numbered for light gun shooters. Add in the death of arcades in the United States and the general mechanism by which they worked being incompatible with modern HDTVs, and it’s easy to see why the genre’s seen better days. For a brief moment, the popularity of motion controllers in the console space seemed to provide a small window for recovery, but that window seemed to close almost as quickly as it opened. Yet, mobile is kind to many a genre seen to be past its prime, something Mad Bullets (Free) is likely hoping to take advantage of. Of course, strictly speaking, Mad Bullets isn’t a light gun game, but let’s not get too caught up in semantics. This is a first-person rail-shooter that deftly tips its ten-gallon hat to just about everything you might love about gun games, along with a few things you might not. It’s an interesting blend of nostalgia and modern design sensibilities. There isn’t much of a story context, but you play as a gunslinger out to rid the Old West of the various outlaws and dangers that plague it. Of course, in what might be a touch of realism, your death is inevitable. The games’s handful of stages simply repeat in a shuffle until you’ve finally run out of luck or skill, with somewhat random enemy placements and the occasional sidepath keeping things from getting stale. The gameplay hopefully doesn’t need much of an explanation. Enemies pop up on-screen, and you need to tap them to shoot them. Sometimes innocent people pop up, and you need to avoid shooting them, unless they have locks on them, in which case, you should shoot the locks and not the innocents. 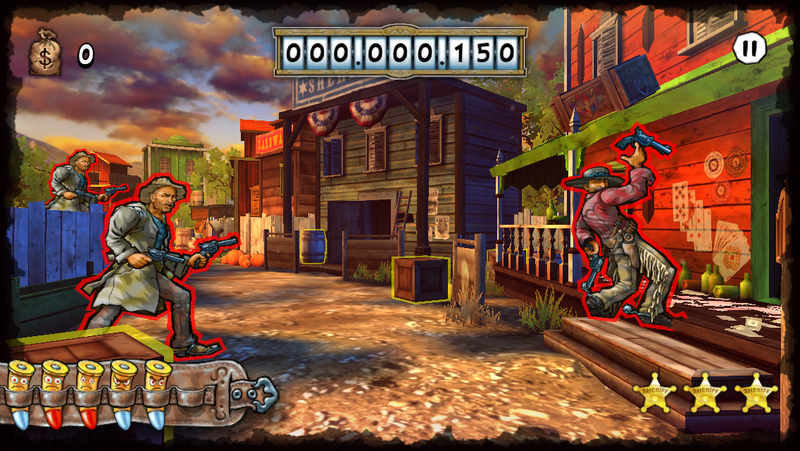 Shooting at various objects in the stages will reveal power-ups and cash. When you run out of shots, simply tap on the reload button to feed more bullets into your gun. You’ll occasionally be directed to choose the next leg of your journey by shooting a sign, but apart from that, you’re at the mercy of a scripted path and pace. The name of the game is score attack, like many classic games, but Mad Bullets brings a few aspects to the table that are decidedly modern. At any one time, you have three different missions to complete along with one daily mission. Completing them will earn you stars towards increasing your level, which determines the number of red bullets you can have loaded into your gun at any one time. Red bullets give you double the points, and if you’re looking to compete on the high score leaderboard, having your chamber filled with them is a must. The missions are actually kind of fun, with some interesting challenges like shooting the beers out of an innocent’s hands without shooting the person by accident. Some of them lean a bit heavily towards grinding, especially the daily missions, but perhaps that’s to be expected given that this is a free game. Another modern touch is the presence of coins, found all throughout the levels by shooting crates, drums, and such. Coins can be used to buy permanent upgrades like faster reloading or an extra bullet in your chamber, to purchase single-use boosts like score multipliers, or to continue. The cost of everything is ridiculously high compared to what you’re likely to pull in during play. While you’re finding your feet, you’ll probably be picking up less than 10 bags in a run, while continuing costs 100 bags. Even with the doubler in hand, you’re looking at a pretty significant grind to buy any of the permanent upgrades. I didn’t mind it too much because there’s really no end goal to work towards in Mad Bullets, so I didn’t feel a lot of pressure to upgrade my character. For people who put importance on getting everything, however, be aware that doing so represents quite an effort here. The action itself is quite good. There are a lot of enemy types, more than you usually see in games of this genre. They can show up in a lot of different combinations and each have their own style of attacking, giving you a variety of situations to tackle. They seem to be able to pop out of just about anywhere in the backgrounds, so you have to stay alert and pay attention to avoid damage. Headshots earn you extra points, which is just one way the game demands a little extra accuracy in your shooting. Some of the innocent townfolk find themselves in rough situation that you can only get them out of through a precise shot or two, with the points reward making it more than worth your while. Between the bad guys and helping out the good guys, you’ll barely have enough time to shoot at the scenery, but there are plenty of rewards for doing so. Almost everything can be damaged or destroyed, most of which will only reward you with points, but some offering up helpful power-ups or coin sacks. I love the game’s visual style, with all of the characters being barely animated paper cutouts, similar to Nintendo’s Hogan’s Alley. From a development point of view, it was probably easier and potentially lowered the age rating, but it also works nicely as a reference to classic games of the genre. The images of the characters might be familiar to people who have a good memory for Hollywood Westerns. One of the most common bad guys is the spitting image of Yul Brynner, for instance. It’s fun to play “spot the reference", though some, like the robotic cowboy straight out of Murderworld, are more obvious than others. The audio design almost perfectly recaptures the sound experience of late 1980s arcade games, with an energetic announcer, faux-sampled speech, loud sound effects, and music that sounds like it came from a lost Midway game. The game also has full support for Game Center, with a variety of leaderboards and achievements covering just about any aspect of the game you’d think to compete on. In terms of monetization, I’ve already mentioned that the game is a bit grindy, and you can buy sacks of coins in various amounts at different price levels. There’s also a coin doubler that costs $2.99, and ads that pop up between rounds which you can get rid of for $1.99. Buying both of these IAPs still leaves you short of a premium experience thanks to the high cost of everything, but if you’re in it for the upgrades, you’ll likely get your money’s worth out of that doubler anyway. The continues are awfully expensive, but since the game is essentially endless, that bothers me less than the high cost of upgrades. Taken as a free game, it’s not terribly far out of line from other free-to-play games are doing economy-wise. 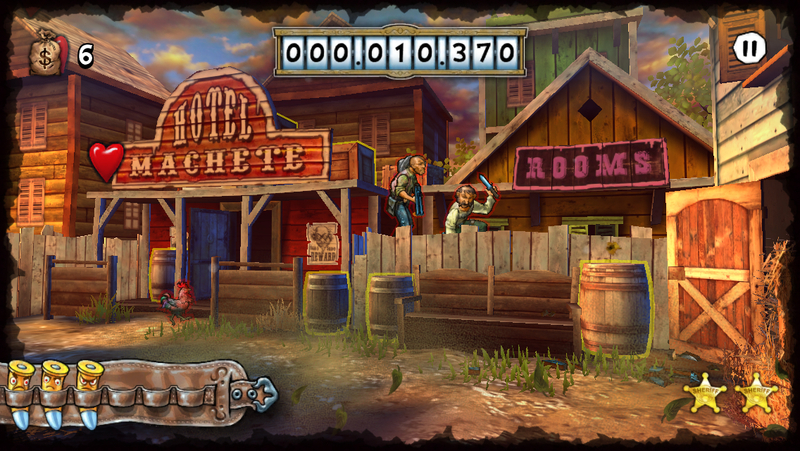 Mad Bullets isn’t likely to revive the genre, but as a lighthearted homage to vintage shooters and Western movies, it’s a winner. It’s every bit as easy to pick up and play as any of the classics, with some extra gameplay mechanics beyond that core that give it a broader appeal. 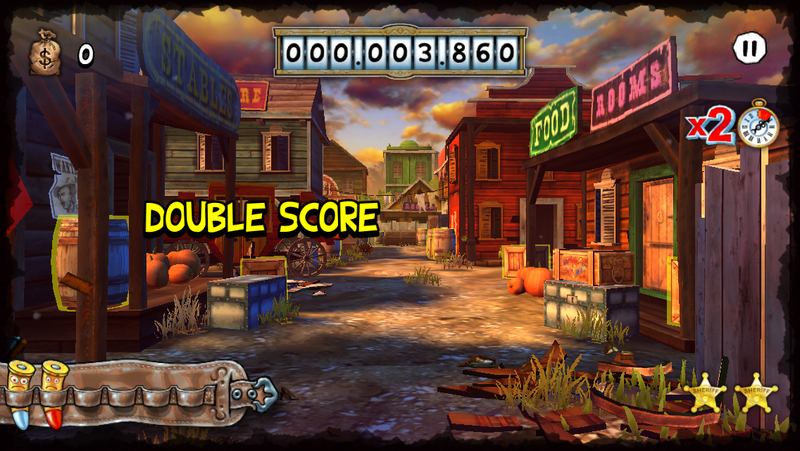 If you like light gun shooters, Western themes, or want a very straightforward action game, you’ve got nothing to lose by giving Mad Bullets a shot. Its tight economy combined with the lack of gameplay variety may end up chasing you away in the end, but you’ll have a great time until it does.